Current and future college basketball stars shone brightly at the FIBA U19 World Championship, in which the USA won gold. HERAKLION, Crete, Greece — When the Americans won gold Sunday at the 2015 FIBA U19 World Championship on this Mediterranean island, their medals had the design of the Phaistos disk set in relief. Phaistos is a piece of clay that could date back to 1850 BCE and has 242 symbols—cows, lilies, dolphins and 42 others—in a spiraling pattern. It's famous in Cretan lore in large part because they dug it up 107 years ago but have yet to decipher its cryptic language. It has become historically important even though no one knows what it means, and thus it was an appropriate choice for an award handed out on July 5, 2015, a day on which Greeks did something historic but no one knows yet what it means. This international basketball tournament held its U.S.-Croatia final on the same day as a Greek referendum, one in which 61% of the voting public said "no" to further economic austerity measures from the European Union. The victors celebrated in Athens' Syntagma Square, hailing the vote as Greece striking back against foreign creditors trying to hold its economy hostage. The skeptics see it as yet another misstep for a devastated economy, already the first developed nation in default to the International Monetary Fund, moving closer to total ruin. No one could say whether Greece could maintain its place in the eurozone, move back toward the Drachma, or when the dwindling supply of cash in the ATMs of the country's closed banks would run out. The only certainty I could find was within the cocoon of the U19s, where scores were being kept, and conclusions could be made about an undefeated crew of Americans who got out, carrying precious metals, before anything in the outside world collapsed. The freshman class of 2015 may not have a blockbuster NBA-prospect point guard, but it has at least one future college star at that position. Jalen Brunson, the 6'1", left-handed, Villanova-bound son of former NBA guard Rick Brunson, was the biggest revelation of this tournament and its clear MVP. Fans may very well mistake the younger Brunson for an upperclassman from Day 1 at Villanova, given his composure and heady combination of facilitating and scoring. On July 4th, in front of a 99.5% pro-Greek crowd wilder than anything he'll experience in the Big East next season, Brunson scored 30 points against the Greeks on 9-of-13 shooting, then came back the next day and played 40 turnover-less minutes (with seven assists) in an overtime win over Croatia in the gold-medal game. U.S. coach Sean Miller was left with a clear impression of what Brunson could become in college. "That kid," Miller said, "is a Final Four point guard." One NBA scout called Giles, a 6'10" high-school senior out of Winston-Salem, N.C., the "most exciting young prospect in this tournament," and I think nearly all scouts and media present were in agreement. Giles has to be considered the frontrunner to become the No. 1 pick in the 2017 NBA Draft. His offense is still progressing—he's refining his jump shot and needs to develop an arsenal of post moves—but he has an otherworldly combination of athleticism (especially with his quick second jump), versatile playmaking skills and motor. Giles was third in the tournament in points per 40 minutes (26.4), second in offensive board percentage (17.1%) and first defensive rebounding percentage (28.7%). He was a defensive game-changer, protecting the rim, dominating the glass, switching onto guards against Euro ballscreen-heavy offenses, and challenging shots on the perimeter. That Giles did this against 18- and 19-year-olds at just 17, Miller said, "is just astonishing." That Giles was by far the most athletic big man in the tournament, despite having torn his ACL, MCL and meniscus in his left knee in FIBA competition in the summer of 2013, and only stopped playing in a knee brace three months ago, was even more astonishing. Tatum, a 6'8" wing from St. Louis who had the second-highest PER on the team (after Brunson), was the other American 17-year-old who thrived playing a year-and-a-half above his age bracket. Once Tatum fills out, he'll be a prototypical high-level, NBA small forward, and he could challenge Giles for the No. 1 pick in 2017. But before that, they may become college teammates. Giles called Tatum his "best friend"; they roomed together in Crete, just as they did at the FIBA U17 Worlds in Dubai last summer, and both want to chase a national championship in 2016-17, what'll likely be their lone college season. Teaming up in college, Giles said, "is mostly definitely what we talk about," and Tatum called it a "pretty strong possibility." They're not as locked together as former USA Basketball teammates-turned-Duke-starters Jahlil Okafor and Tyus Jones were during their recruitment, but Giles and Tatum do have three overlapping schools on their respective lists: Duke, Kentucky and North Carolina. If any of that trio pulls off the package commitment, it's instantly the favorite for the 2017 title. 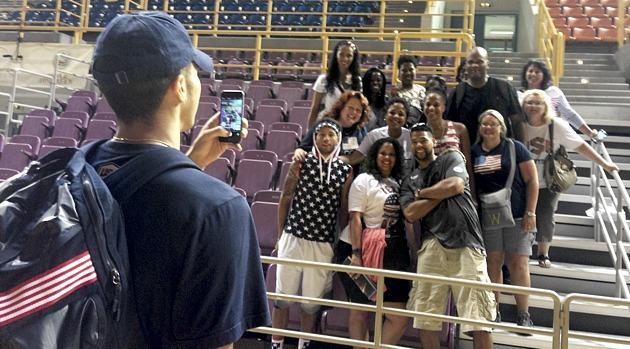 Tatum also had the distinction of the largest cheering section for any U.S. player. His crew was 14 strong in Crete. Tatum's mother, Brandy Cole, made me a list: her, his grandmother, Kristie Jursch; his brother, Brandon Dunlap; and then two godparents, three aunts, two cousins, and four family friends. "We're always been the biggest fanbase anywhere Jayson plays," Cole said. "We just turned this into our family vacation." ... but Team USA didn't get there by Pack-Lining, like Miller does at Arizona. They pressed full-court and were opportunistic in the halfcourt—a tactic passed down from the previous U19 coach Billy Donovan, for whom Miller was an assistant in 2013—and led the tournament in turnovers-forced percentage (21.9% of possessions). In the 2011 U19s in Latvia, I watched a Paul Hewitt-coached U.S. team inexplicably sit back and get burned by Russia's halfcourt offense en route to an upset loss in the quarterfinals; here, the U.S. killed valuable time off the 24-second shot clock, got opposing offenses (aside from Croatia in the title game) out of their rhythm and leveraged a clear athletic advantage, as their two highest-impact American defenders, Giles and freakishly long wing Josh Jackson, were best-suited to that style. "The teams we're facing here were so well-versed offensively, with such great continuity," Miller said, "that it made no sense for us to go toe-to-toe just as a halfcourt defensive team." That Miller and his staff (brother Archie, the head coach at Dayton, and Providence's Ed Cooley) were able to build a defense that allowed just 0.777 points per possession, flummox top European 19-year-olds, beat Greece in Greece and win gold with a core that had either yet to play their senior year of high school (Giles, Jackson, Tatum and Terrence Ferguson) or yet to appear in a college game (Brunson and Allonzo Trier), deserves high praise. Miller's success here makes him a likely candidate for future USA Basketball appointments, but he has concerns about some of his college coaching peers' support of the national program. Team USA relied on its super-young core out of necessity rather than choice, after a number of key 18- and 19-year-old American prospects turned down invites. This did not please Miller, who in recent years has made Arizona players Aaron Gordon, Stanley Johnson, Rondae Hollis-Jefferson, Kaleb Tarczewski and Allonzo Trier available for U.S. tryouts. "I feel like it's my obligation as the coach at Arizona, that if one my players is invited and he's healthy, and doesn't have an academic situation, that he has to go try out," Miller said. "It brings out the best in kids because they're pushed to the limit. ... But there are a number of programs, and coaches, that did not send one player who was invited. And I don't want to say anything negative about the team that we have, because we have a talented group, but we should never as a country be this inexperienced coming to a tournament of this magnitude. "It's fundamentally wrong for us to bring a team over and not have a number of players that should be here, or should have tried out, and didn't." The U.S. starting lineup might have been completely different had all of the nation's talent been available. Miller didn't name names, but it wasn't difficult to deduce who was missing, including Duke's stable of four top-25 freshmen (Brandon Ingram, Chase Jeter, Derryk Thornton and Luke Kennard); Cal's top-five wing, Jaylen Brown; and Maryland's incoming five-star center, Diamond Stone. The Americans still won gold, but the relying-on-17-year-olds model isn't sustainable over the long term. Onuaku, who shot 46.7% from the free-throw line as a Louisville freshman, received an extreme request from his college coach, Rick Pitino, this off-season: start shooting underhanded. Pitino showed Onuaku film of Hall of Famer Rick Barry, who shot 89.3% on underhanded three-throws as a pro from 1965-80, and told Onuaku to get to work on this lost art. Onuaku shot 60% (6-of-10) using granny-style in the U19s, and said he fully plans to shoot that way at Louisville this winter, believing he can get himself up to 67% from the stripe. His real value, though, is always going to come from his rim protection and physical defense, as he played an instrumental role in containing Croatian center Ivica Zubac in the gold-medal game. Allonzo Trier, CG, Arizona (Fr. ): Natural scorer who'll be a big part of the Wildcats' offense, but was limited over the U.S. medal-round games due to an ankle injury. Jawun Evans, PG, Oklahoma State (Fr. ): Served as the backup point behind Brunson, which was a hard act to follow. Played solid defense, but the dropoff in playmaking from Brunson to Evans was significant. Josh Jackson, SF (HS Sr.): Has a chance to be an incredible defender due to length, agility and activity level, and has an outside shot of challenging Giles and Tatum in the race for the 2017 No. 1 pick. Terrance Ferguson, SG (HS Sr.): Cold-blooded shooter who was the most reliable long-range threat in the knockout phase of the tournament, making 7-of-15 from deep. L.J. Peak, SG, Georgetown (Soph. ): Earned a spot at the back end of the rotation by doing little things well, but his skills translated better to Big East play last season than they did to international stage. Caleb Swanigan, PF, Purdue (Fr. ): Will have a bigger role with the Boilermakers than he did here (playing 13.8 mpg), and rebounded well, but I don't know if he's polished enough as a scorer to dominate in the Big Ten as a freshman. Thomas Welsh, PF, UCLA (Soph. ): Last big man off the bench; best skill was rebounding, but he didn't see much action in the biggest games. Can be a valuable college big man but didn't make a leap forward in Greece. Justin Bibbs, SG, Virginia Tech (Soph. ): Late add to the roster after Kentucky-bound Isaiah Briscoe suffered a concussion in training. Played too few minutes here to be evaluated. Should be happy to get out of Greece and back to Blacksburg, where he'll have plenty of long-range shot opportunities in '15-16.